Clean Eating Protein Bars - REVIEWED! 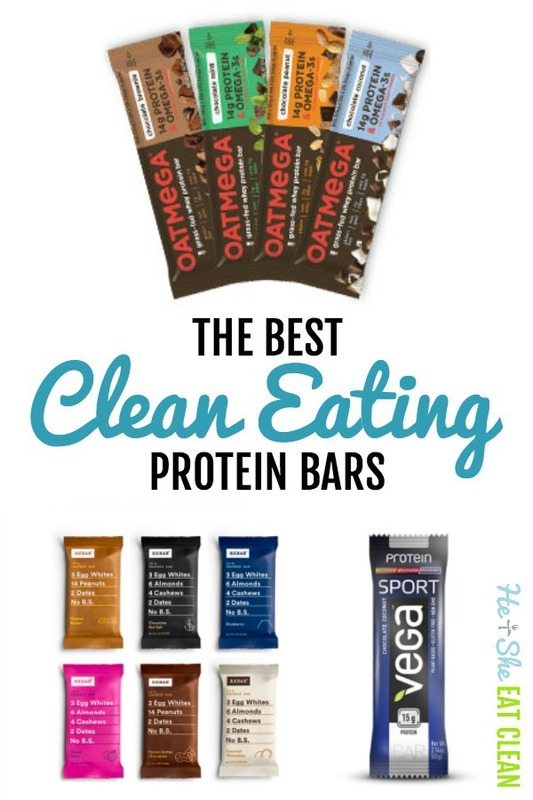 Home » Education » Clean Eating Protein Bars – REVIEWED! Low in sugar, high in protein, and clean ingredients do exist in protein bars! We’ve compiled the healthiest, best tasting, and readily available protein bars. We try to eat real, whole foods whenever possible, but let’s face it… sometimes we just don’t have enough time in the day to cook a fresh meal. We also hike and travel a lot, so having a clean, pre-packaged protein bar option is an absolute necessity. Just like with protein powder, we are often asked about our favorite protein bars. There are A LOT of protein bars on the market that are really just candy bars wrapped in a package and labeled as a protein bar (check out the sugar content on your favorite!). Many are also loaded with junk ingredients and a protein source that is less than ideal. It’s important to look at the ingredients and nutrition facts in order to make the decision on which one is best for you. We’ve mentioned our favorite protein bars in our posts on What to Eat While Hiking, Clean Eating Food for the Airport, and Clean Eating Road Trip Food, but we wanted to bring them to you all in one place. The list below is not exhaustive, but outlines a few of our favorite clean eating protein bars we think you should consider when you’re “on the go”. The OATMEGA Protein Bar comes in numerous flavors like Blueberry, Chocolate Brownie, Chocolate Coconut, Chocolate Mint, Lemon Chia, etc. The bars are made with grass-fed whey and the ingredients are gluten-free and non-GMO. The bars have added Omega-3s added from fish oil (hence the name, OATMEGA) for an added level of nutrition. The actual nutrition facts may vary slightly depending on the flavor but our favorites contain 14 grams of protein and only 5 grams of sugar. Scott’s favorite is the Lemon Chia Flavor and Whitney likes the Chocolate Brownie. P.S. They now have OATMEGA cookies! They have a ton of different flavors to choose from like Peanut Butter & Berries, Chocolate Sea Salt, and Mint Chocolate. Scott’s favorite is Maple Sea Salt. Whitney likes the Peanut Butter & Berries (tastes like PB&J!). TIP: If you heat your RXBAR in the microwave for 8 seconds it is even more delicious. Of course, this wouldn’t work if you are hiking or in your car but try it next time you are enjoying one at home. P.S. They also have RX Nut Butter packets. All flavors are delicious but I’m NOT exaggerating when I say the Vanilla Almond Butter tastes like Cookie Butter. We’re OBSESSED. Eat it plain or try it on a rice cake or toasted Ezekiel bread. If you are looking for something similar to a Quest bar, try the Kirkland Protein Bar (Costco’s private-label brand). They are currently offered in 4 flavors (Cookies & Cream, Chocolate Chip Cookie Dough, Chocolate Brownie, and Chocolate Peanut Butter Chunk). The nutritional facts will vary based on the flavor but they all have at least 17 grams of protein (most have 21 grams). All flavors are gluten-free and contain no artificial flavors. Best of all…only 1 gram of sugar! These bars are also great heated in the microwave for about 8 seconds. Vega is the plant-based protein powder we use most often and we’re huge fans of their protein bars. Available in flavors like Crispy Mint Chocolate and Crunchy Peanut Butter, they contain 20 grams of plant-based protein. They are also gluten-free, vegan certified, and Non-GMO. RISE is another great vegan protein bar option that contains only a few ingredients. Some flavors use whey protein and some use plant-based protein so double check the flavor you choose if that is something that is important to you. They are a bit higher in sugar but carry a lower glycemic load due to the types of sweeteners used (coconut nectar or honey). With flavors like Almond Honey, Mint Chip, Snickerdoodle, Cacao Banana (all use whey protein) and Lemon Cashew or Chocolatey Coconut (both use plant-based protein), how could you go wrong?! These bars are fun and great to mix it up when you’re tired of the bars listed above. Most flavors contain at least 20 grams of protein and are made from real, whole food ingredients. Also, check out our reviews of Clean Eating Protein Powder and Plant-Based Protein Powder.